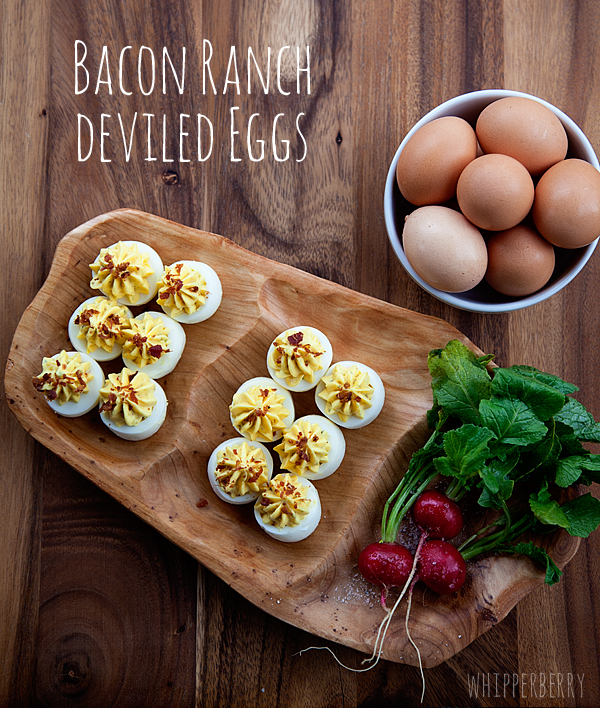 Bacon Ranch Deviled Eggs // I’m a Hidden Valley Girl through and through. I think my father made sure to add a little of the mix to my formula as an infant just to make sure it ran deep in my veins. Alright, maybe not. But, I can’t remember a childhood dinner with some form of Hidden Valley Ranch on the table. In the lean years when I was younger my Mom would mix it from the powdered mix and we always had some in the fridge. I remember when she finally started buying the bottles of pre-made dressing, I thought we had finally made it. We were on easy street… We had bottled Hidden Valley Ranch on the table. Isn’t it funny what little minds come up with. The reality, she was just ready to let Hidden Valley take over the mixing, because she was a little busy. Today, I have a daughter who would love to have Ranch as one of the major food groups so that she could have it with EVERYTHING. She would drink the stuff if allowed. When Hidden Valley asked if I would be interested in remixing a classic recipe with one of their Ranch products I thought in honor of my Dad and my sweet Em, I couldn’t pass up the opportunity. 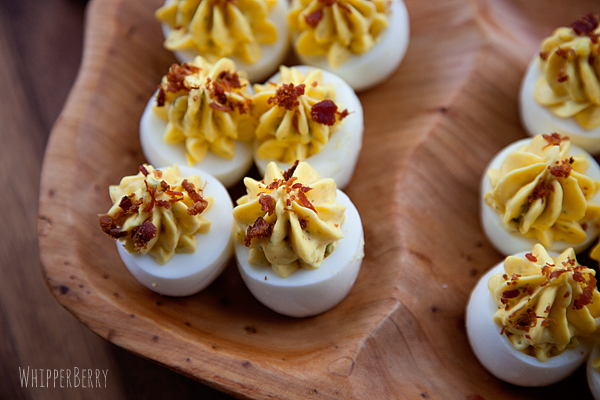 I decided with Easter right around the corner, I should remix the classic Deviled Egg and add a bit of a ranch kick to the Easter staple. Here is my Bacon Ranch Deviled Egg remix. Hidden Valley® Original Ranch® Salad Dressing and Seasoning Mix is a simple way to add a flavorful kick to a classic recipe. Click here to find more classic recipes remixed with Hidden Valley Ranch. Also check out the Ranch Remix contest for your chance to win great prizes! You could win a trip to New York and visit the Food Network!! DREAM prize for me. All you have to do is share how you would REMIX one of your favorite recipes with Hidden Valley Ranch! I decided I should remix the classic Deviled Egg and add a bit of a ranch kick to the Easter staple. Here is my Bacon Ranch Deviled Egg remix. Cut eggs in half and carefully remove the yolks into a small bowl. Set white aside. In the yolk bowl add mayonnaise, mustard, Hidden Valley Ranch mix, relish, salt & pepper. Mix well until the yolk mixture is really smooth. Add the yolk mixture back into the egg whites and garnish with the fine bacon bits.